Bubby and Bean ::: Living Creatively: Hello Pretty Offices, May I Work in You? Hello Pretty Offices, May I Work in You? With it being mid-April and all, I've been thinking that it might be time to give my office space a good spring cleaning (and/or complete overhaul). I really do try to be organized, but I've noticed that it's much easier to make a pretty space in my studio, where being creatively inspired is, well, obvious. My office space, a tiny loft area brimming with way too many piles of papers and cardboard boxes, is all but crying out for some makeover love. For motivation, I've been collecting lots of lovely images, a few of which are posted above. 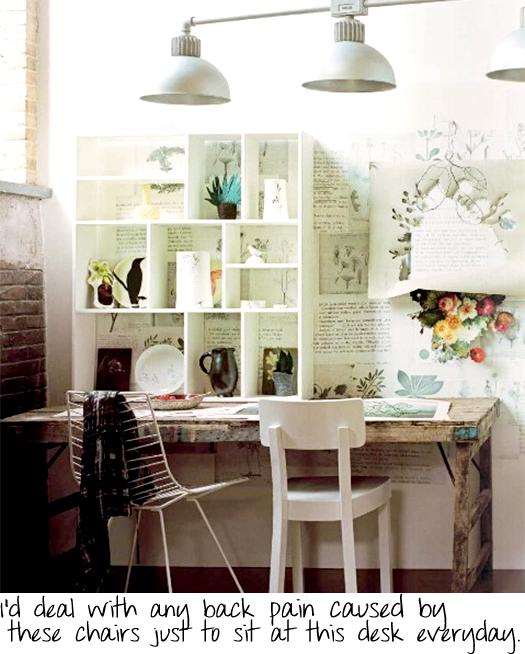 Do any of you have office spaces you've recently redone? If so, I'd love to see some photos or hear what you've done. Have a beautiful Thursday, darlings. P.S. I'm still on the look-out for an old card catalog, which I'm certain would make my office especially happy. Image sources from top: here, here, here, here,& here. 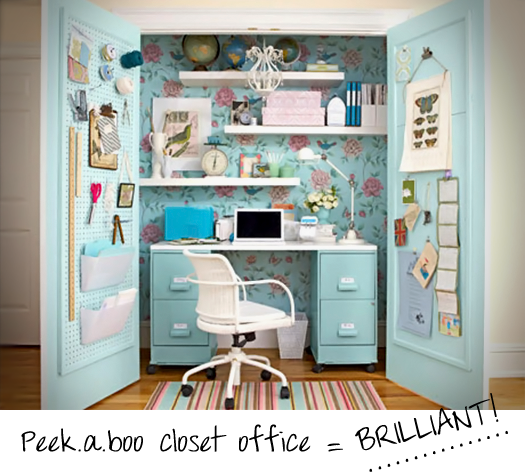 Have you seen Kally Rae Roberts' closet office that she made using that one above for inspiration? Its perfect! You can see it on her blog...just google her name. Oh my, I didn't think I could like anything better than that efficient little all-white space until I saw the beauitful office-in-a-closet. May I have it, please? i would love to just have an office! right now i have no creative space, so i would kill for a measly plain desk and a chair! those are lovely though :) I would also like any of those please! oooo i would love to work in the top one! theres a nice feeling working in a clean office, i would definitely be keeping all my pens in colour order in there! The last space looks like my own:) they were all beautiful, I think I'd be too afraid to even go into that spectacular all white office! Thanks for sharing... now I feel like a little spring cleaning/makeover! These are all 100 times cuter than my office space! Mine needs an overhaul too! I love the bottom image. I agree that it's pretty and organized but still feels real :-). There's nothing quite as satisfying as sitting down to do some work at a nice, clean work desk! I know I can't organize myself for anything if I'm sitting in a mess. 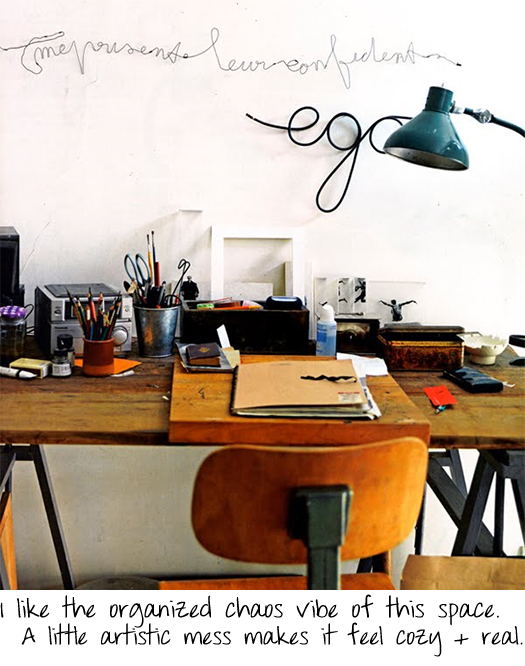 Drooling over these great office spaces as I work in my cluttered nook. I love the white desk! wow, love that second to last one! What a dream! They are all such beautiful layouts. :) Thanks for sharing. It's inspiring. I'm following! Thanks so much for your comments everyone! I'm glad I'm not the only one with the need for an office makeover! Oh, these are so inspirational! 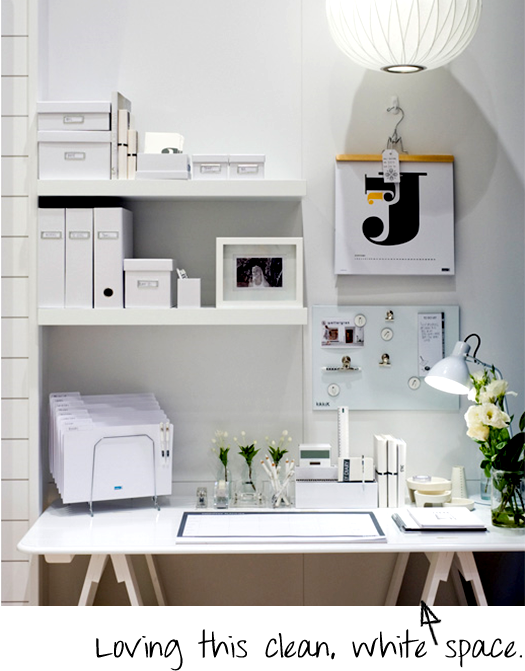 I love the closet office - that's ingenious how they utilize the doors for extra storage space. I think I'm due for a little re-organization, too. That closet office is AWESOME!!! Love the colours and the style!!! I'm back to tell you that I tagged you for the versatile blogger award.